I won’t go into the usual opening historical preamble as the development of the various Valentine models is way too complicated for just a brief paragraph or two, so I’ll simple get on with the review and refer you to the list of references below for more details on the tank. 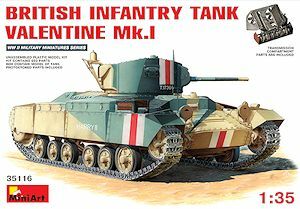 AFV Club has released their second kit of the British Infantry Tank Mk.III Valentine representing the Valentine Mk.II following the first kit of the Valentine Mk.I (kit #AF35178). 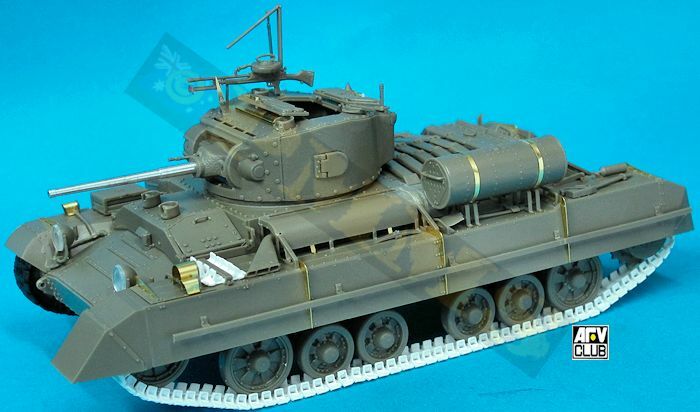 Miniart has also released six Valentine kits over the last few years with three more slated to come so this review will also be a detailed comparison between this AFV Club Valentine Mk.II kit and the Miniart Valentine Mk.I (kit #35116). 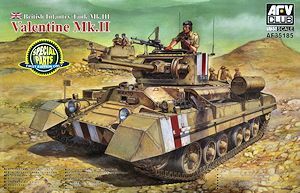 The reason I chose this Miniart kit for the comparison is that it is closer to an Mk.II than the Mk.I and includes an option for a desert Valentine with the larger sand shields peculiar to Valentines used in the African deserts as does the AFV Club kit. While five of the books listed below include 1:35 plans this did little to establish absolutely the correct overall hull dimensions as they all varied in different areas by small degrees. As a consequence in determining the actual kit dimensions I have used a consensus of the plan dimensions in conjunction with analysing actual period and museum photos of the Valentine as well as know dimensions, e.g. wheel and sprocket sizes. Both kits have different hull dimensions again by small degrees but in most areas the AFV Club kit matches the plans and data more accurately than the Miniart kit, there are a few notable dimensional issues with the Miniart kits that should be mentioned but both kit hulls match the available plans in width; it is just the length and individual hull sections that have some issues. The Miniart overall hull length is consistently shown as about 1.5mm short on all plans but by far the biggest issues with the Miniart kits are the rear louvered access doors which are 3.5mm too short in height and set at too high an angle on the hull altering the rear hull profile while at the front the angles of the two side angled glacis panels on the Miniart kit are way too shallow, this alters the shape of the lower front hull plate and driver’s plate, we will deal with these issues more closely in the relevant chapters below. Another issue is the size of the drive sprockets with the Miniart sprocket disc being 1.5mm larger in diameter than the AFV Club sprocket disc. Both sprockets have the correct 20 teeth but this raises other issues regarding track fitting around the different sized sprockets. There are also issues with the road wheel sizes wheel spacing other than the style of road wheels and this will also be covered in more detail below. Both kits feature the early spoke road wheels which were used on the initial Mk.I and about 100 of early production Mk.IIs, there is photo evidence of Mk.IIs having this type of road wheel but the majority used the later style wheels with pressed indentations around the rims. The main issue is the decal options included in the kits (notably the AFV Club kit) refer to vehicles fitted with the later wheels meaning you can’t accurately reproduce the marking options provided unless using the later style wheels, more on this below. The turrets of both kits measure out quite well although the Miniart turret according to most plans is just under 1mm too narrow but this is really not worth bothering with as it doesn’t alter the turret profile to any great degree. There are also quite a few detail issues which we’ll cover in the respective areas of the review below. Also an article on fitting the various afternarket tracks to the kits will follow shortly dealing with the fit as a consequence of the sprocket size issue mentioned above. The kit represents the Valentine Mk.II and includes the features well including the two hinged rear louvered access doors with a choice of minimal fender skirts or the full extended sand shields for the desert marking options. As mentioned above the kit still includes the Mk.I style spoke road wheels and while these were used on the first batch of Mk.IIs the majority had the later style wheels which limit the marking options for the kit somewhat. Also included is a delicate Lakeman mounting and Bren gun for the turret roof which was a common fitting for desert Valentines. The kit consists of 356 parts in olive drab plastic on 11 sprues, 20 clear parts on 1 sprue, 35 etched brass parts, 2 lengths of vinyl track and small vinyl washers, 1 aluminium barrel tube, four spare individual track links in white plastic (from track set #AF35197) plus a small decal sheet and 20 page instruction booklet. Most of the sprues are from the first Valentine Mk.I kit (#AF35178) but in the olive drab plastic with just 2 new sprues K and N for this kit, this means there are some parts carried over that are not used. The standard of moulding is very good with clean crisp details on the parts including subtle cast texturing on some of the suspension, hull and turret parts for an enhanced appearance, there is just the faintest of flash on a few parts and the occasional pin marks, notable inside the crew hatches but other than that the parts are blemish free. There are the usual mould seams and excess plastic nodes to be carefully removed before assembly as with many kits these days. Some of the small and finely moulded parts will need care removing from the sprues and the etched parts cleanly done with bending lines to aid in assembly. Overall view of AFV Club kit with kit supplied tracks fitted and showing the minimal front fender skirt option. The kit is labelled as Mk.I but includes the double hinged rear louver access doors and sheet metal exhaust covers. Early Mk.I’s only had the left door hinged with the right door fixed as depicted in the AFV Club Mk.I kit #AF35178 as well as having mesh screen for the exhaust covers, but final production Mk.Is also had the double hinged doors as featured on all subsequent Mks. Note; Miniart has produced a Valentine Mk.II kit #35096 but this kit is currently shown by Miniart as “out of production” therefore I have gone with kit #35116 but apart from kit #35096 including the later style road wheels it utilises the same parts as this kit so the all the comments below still apply equally. The kit consists of 438 parts in light grey plastic on 9 sprues with another 220 track links in light grey plastic on 5 sprues, 50 etched parts plus a decal sheet and a 16 page instruction booklet. Also included as a bonus are the 5 figures from the Miniart set #35071 British Soldiers Tank Riders made up of 75 parts also in light grey plastic. The standard of moulding is good overall with very little flash or pin larks to contend with, the main clean-up is the usual plastic nodes and mould seam lines that does need care on some of the smaller as does removing them from the sprues. The detail definition is okay but a little soft in places compared to the AFV Club detail and the etched parts are nicely done with the usual bending lines included where applicable. Overall view of Miniart kit with kit supplied tracks fitted and showing the minimal front fender skirt option. From a purely detail and accuracy viewpoint the Miniart kit has some quite substantial issues such as the glacis plate angles, the rear louvered door sizes and the incorrect fitting of the upper hull plates as well as the wheel issues and undersized pioneer tools. 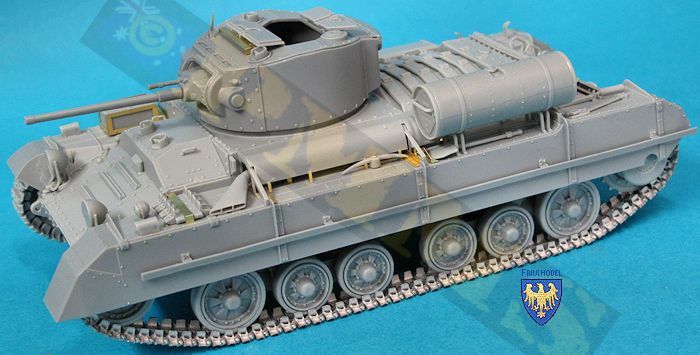 All the same areas are depicted correctly on the AFV Club kit according to the available references as well as most of the details being more refined and better presented such as the surface texturing on the turret and hull parts and other details. The Miniart kit on the other hand with the lesser number of parts such as the one piece upper hull/fenders and simplified suspension is a far quicker and easier build than the more complicated AFV Club kit with the multi-part upper hull and suspension assemblies for example. 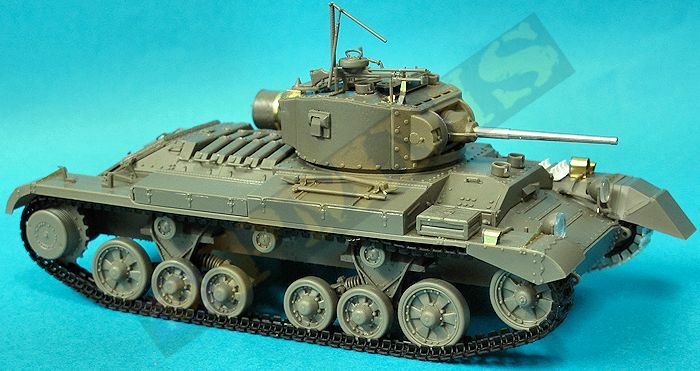 So in the end if you want a fundamentally more accurate and detailed kit of the Valentine Mk.II the AFV Club kit would be the clear choice but if detail/accuracy is not a high priority in favour of ease of assembly then the Miniart kit would fill the bill, I guess it’s like we have seen previously with other kits the final choice is up to the individual and what they want from their kit. And Miniart have produced (or will) just about all the different Mk. of Valentine gun tank and it’s yet to be seen if AFV Club will follow on with more versions like they have done with their Churchill series. Thanks to my credit card, and for the review kits.